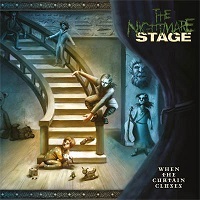 American Progressive Power metal quintet THE NIGHTMARE STAGE returns after nine years of dry spell with their second full-length album “When the Curtain Closes” via Pure Steel Records. This is their first album with a label as they released their 2010 debut “Free Admission for the Damned” independently. The album comprises of ten tracks, just three minutes short to play a total of an hour. The “show” begins with “A Demented Impresario”, a classic US-prog power metal. It has a brief intro and a good buildup, although the riffs are not that catchy. The mid-paced attack is main suspect to the overall tense mood. However, the song has a tendency to be too repetitive, and the lyrics are mid-tier. “Returns Again” comes in igniting with tons of energy. The orchestrations give the song a special haunting theatrical touch. The bass lines are strong and solid in this track, and it’s very well above the mix, which truly makes a bombastic song. Alongside high-energy songs are two gloomy power ballads, “The Infamous” and “This is the End”. All-out aggression is what they displayed with “Future I See”, with Scott Olivia bragging his astounding vocal range. Almost the same thing is what went on with “Dark Skies”, except that the riffs of the said song are a lot stronger and more memorable. Strangely, as the album goes on, it feels like the time starts to slow down, as if the songs would never end. The songs never lack the energy and excitement, but they are simply too long. For example, a minute could have been shaved from “Dark Skies”, and some other songs whose verses are repetitive and the solos are un-progressive. There are also lots of lazy passages which would have easily been removed. It is only until “From Below” where I found actually interesting riffs and an equally melodic and aggressive tune. It is easily the most memorable song in the album, with a very catchy drum pattern and hooking verses. Although the chorus does not quite cope up with the intensity of the verses, it does just enough to keep the energy up and kicking. Judging albums like these is what makes my (usually) easy and enjoyable job a bit difficult. It has rich progressive elements, the energy is there, the talent is definitely on full display, and the album is consistent but diverse. On the other side, the songwriting needs more creativity, the riffs need more power, and the solos need more interesting content. Memorability is also one hell of an issue. Lastly, what is really missing in this album is that one distinct song that could stand out among the rest, and hence address the issue of memorability.